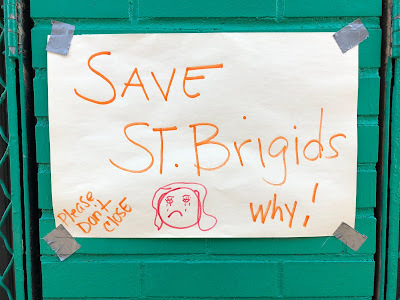 EV Grieve: Report: What happened to the donated money earmarked for St. Brigid School? Report: What happened to the donated money earmarked for St. Brigid School? As noted on Friday, students, parents and local residents will gather this morning — at a mass at 10 or afterwards at the school — to show "support and solidarity in saving our beloved school." "The donor also has given $2 million to establish an endowment to help the parish meet the spiritual needs of community residents. 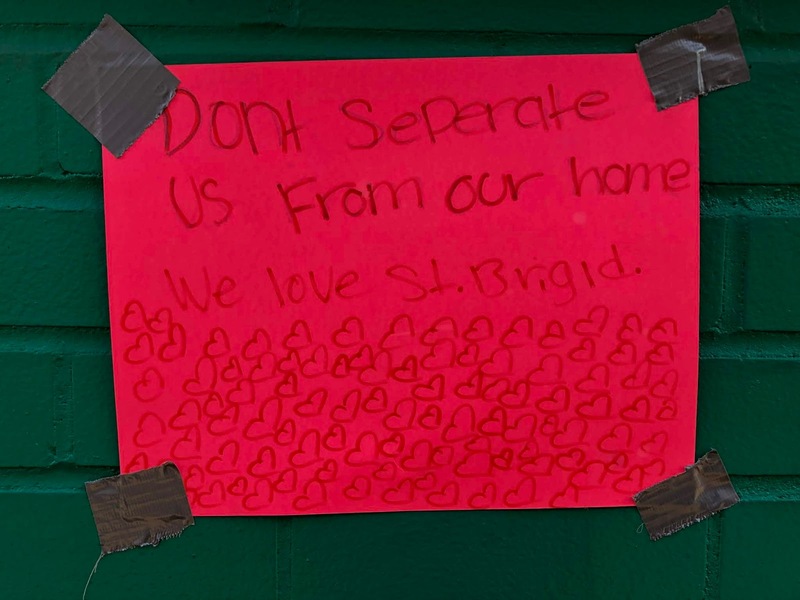 A separate gift of $8 million will support Saint Brigid School, and other Catholic schools in need." "There still was a significant amount of money left," said Edwin Torres, who formed an organization to save the church. He said the cash went to the Archdiocese and there should have been at least $2 million for the school. "They really haven’t shown an accounting for that," he said. 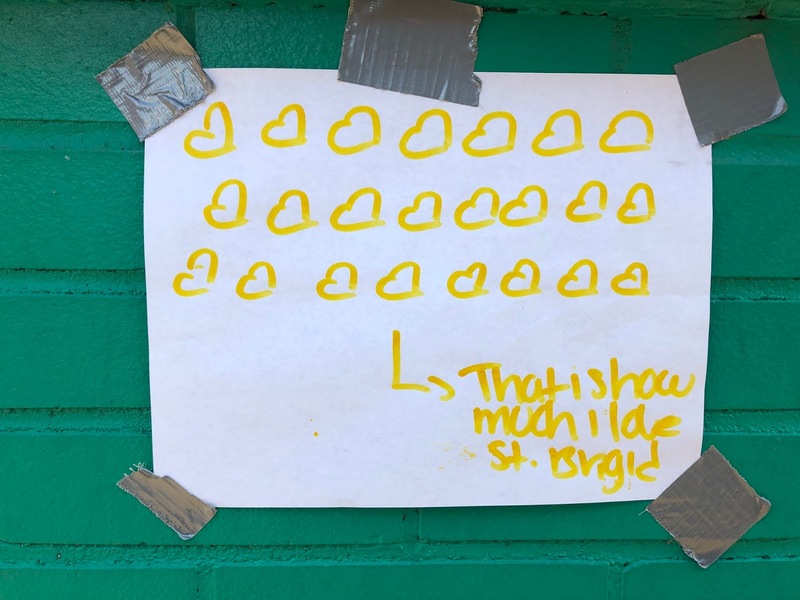 Joseph Zwilling, an Archdiocese spokesman, told the Post the school did have money left in its endowment fund — about $1.5 million. But he said the school is losing $850,000 a year, a loss the Archdiocese has been covering. 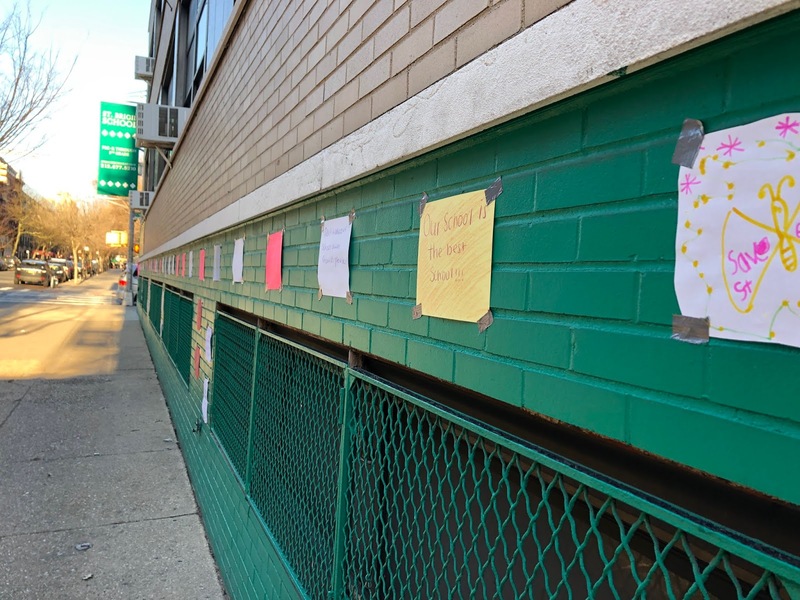 "It is a sad reality that it is nearly impossible to run a school with only 119 students in Grades K-8," Zwilling said. 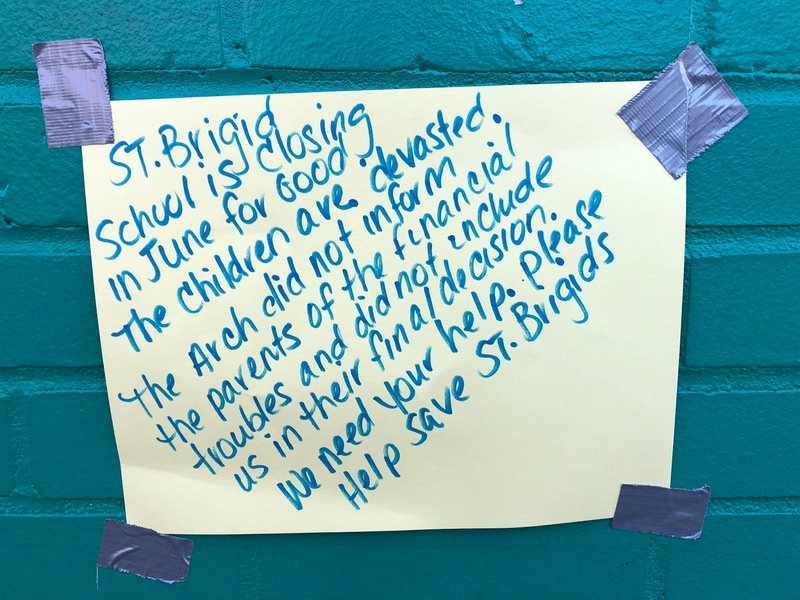 Matthew Daloisio, a St. Brigid parent working to save the school, said the $1.5 million was "absolutely a lot of money" and parents would work to boost enrollment if that would keep the doors open. 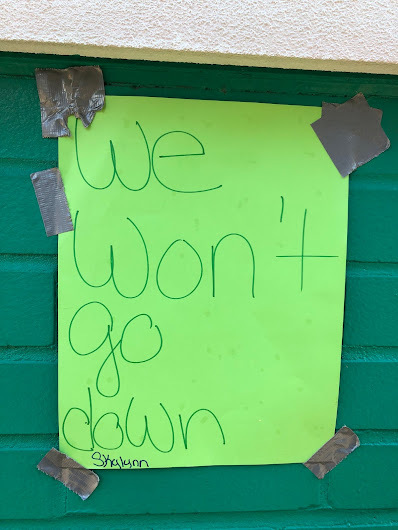 "Then with our help, there should be no reason the school can't stay open," he said. 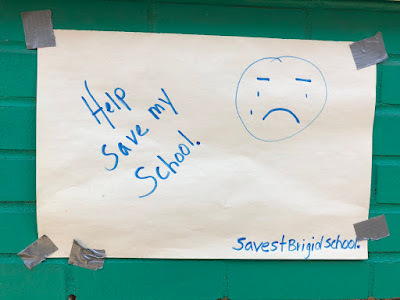 There is also a petition in circulation (link here) to help save the school. Oh boy. This is heartbreaking for so many reasons. Those poor kids. I am skeptical if any of this will work. 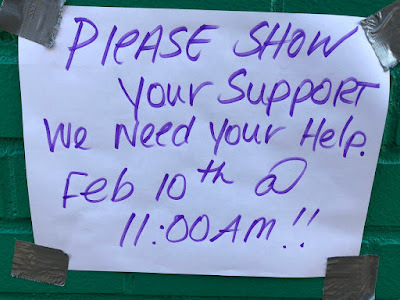 The church is in desperate need of cash to pay off the victims of sexual abuse and probably want to rid themselves of more property or liability. Who knows. Time will tell. 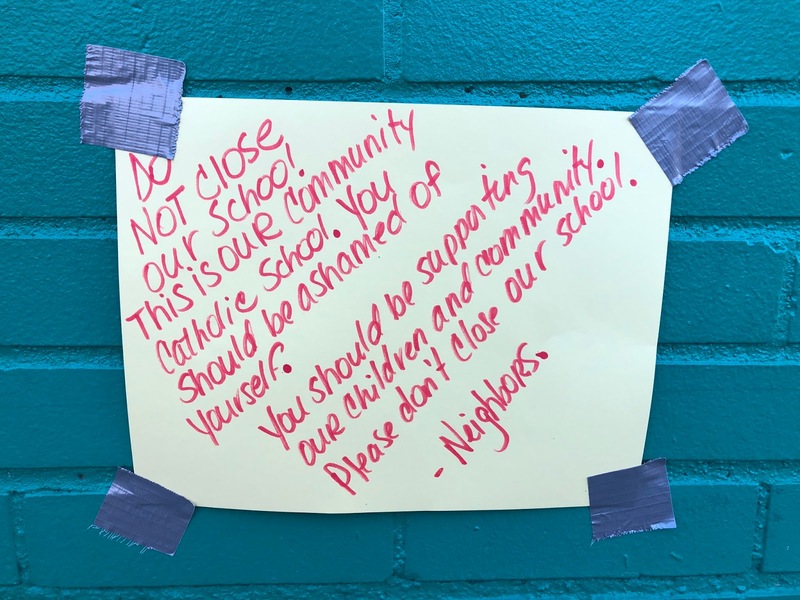 It seems to be a breach of faith by the Archdiocese to the Benefactor with funds still available for the school and closing it. The whole announcement and disregard for the Parish brings into question motivations. The enrollment is too small but that does not mean a recruiting drive can not reverse it. Perhaps curriculum and specialized programs can be introduced attractive to parents able to meet the tuition? 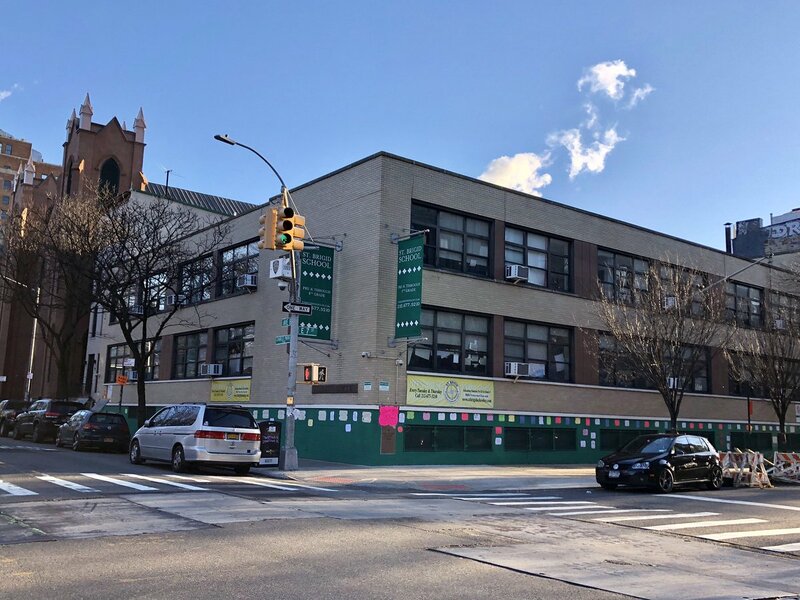 As graduate of Catholic High School and two degrees from a Catholic University I am taken back by this, what role does the increasing value of East Village real estate play into the equation? The church is always seeking Donors and Benefactors what message is sent in breaking faith with this one? Does the school really only have 119 students? How on Earth is that possible? I attended St.Brigid in the late 50's. Was baptized, did my first holy communion, confirmation, was a former holy name Society Member. And, in the most humblest way, served on my Community Board for the area. Unfortunately, while it may not be relevant to the subject at large. As a male of Puerto Rican decent, I am appalled to have witnessed on many circumstances (just this morning at the 10AM mass), acts of biased behavior, (not in general), but,from several non Hispanic parishioners (including school parents). Such divisive behavior amongst parishioners do not help the overall challenges the school or church faces. Send your kids to Public Schools instead of Catholic ones. The Catholic church is an institution that promotes and activly calls for restrictions on the access to women's healthcare and the right to choose and decide what happens to their own bodies. A certain person in charge of doing the tours for the school is the reason there are only 119 kids in the entire school. The school wont get rid of the vile person no matter that parents have complained numerous times at how awful it is. There are many factors playing in to why the church would close the school, but money is obviously the main reason. When you look at the changing demographics in the neighborhood things become clearer. Wealthier and educated people are less likely to send their kids to Catholic school these days, since there are charter school options, which are better than the public schools and they have no church agenda at the charters. Why would people send their kids to a school that’s anti-abortion and evolution, when church doctrine doesn’t align with your beliefs? At one time, Catholic schools were a better educational option to public schools, but that’s just not the case anymore. Statistics show the more education a person has the less likely they are to believe in God, and this is especially true for millennials in America. What we are witnessing is the fall of the Church, which is not a bad thing. There just needs to be an option for the remaining students, so that they can get a proper education in their neighborhood, same as the wealthy kids. Love @11:38. "Breach of faith" HA! The Catholic church?! Naw? What ever gave you that idea? It was nice to see the whole community come together in this meeting.Gale Brewer Manhattan Borough President, Carlina Rivera, Harvey Epstein, Brad Hoylman, Eddie Torres, GOALS, CodaLes, Anthony Feliciano, Julian Morales aJohn BLasco. 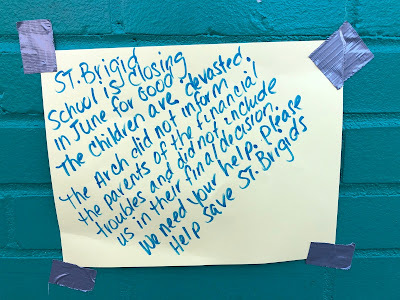 I am appalled at the actions of the archdiocese on the way they handled the decision of school closure and the delivery to the families of St Brigid school. 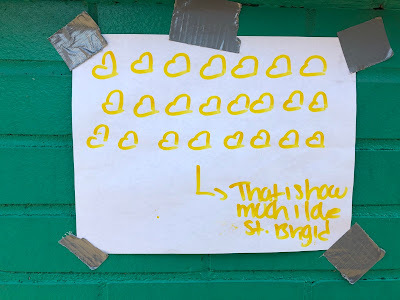 The archdiocese owes it to the children in the community to invest in the children especially with all the scandals happening in the Catholic Church. My hope is the donor comes forward to ask questions about the money and how it was spent! 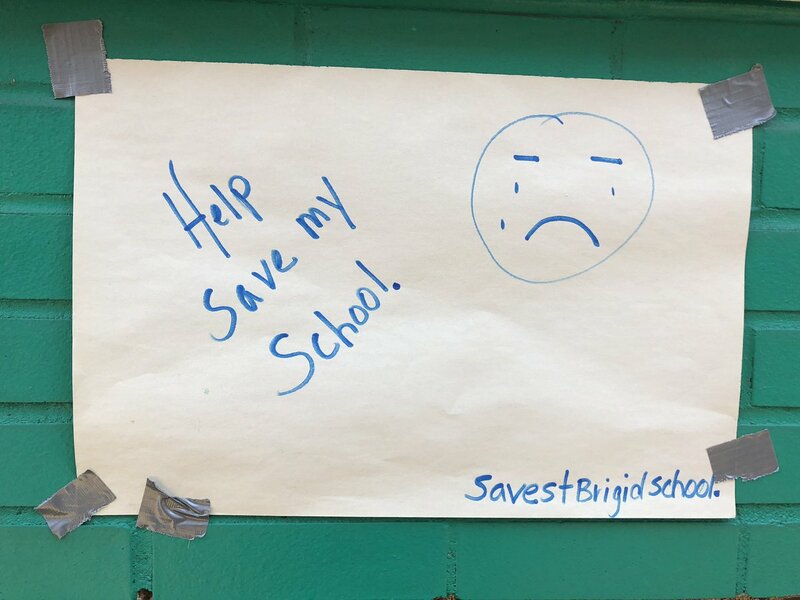 Please help the school! Watching the children and teachers cry is so heart breaking. The children are distraught!! 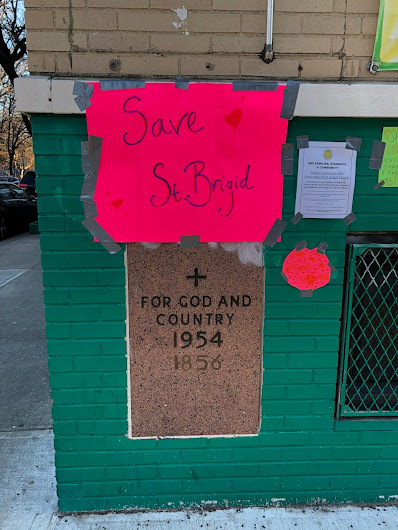 Please Angel of GOD , Help Save St. Brigid School! @11:38am: "what role does the increasing value of East Village real estate play into the equation?" I can tell you: It matters enormously. MONEY is just about the only thing that matters to the archdiocese at this point. The archdiocese of NY is in the REAL ESTATE business, period. Of course, they could try selling off Dolan's nice little townhouse on Madison Avenue, behind the cathedral ... but that won't happen, will it? Meanwhile, I see that GRACE CHURCH has signs INVITING students to come join in Episcopal services there each week - THAT'S how you actually maintain a congregation, esp. if you are across the street from a DORMITORY. Whereas the Roman Catholic Archdiocese of NY can only think of selling off churches, rectories, convents, and schools, EVEN WHEN those locations are also right where plenty of existing AND potential parishioners live. That tells me that Dolan is looking only at the $$$ bottom line. Dolan is a good businessman and, IMO, a lousy pastor. He's killing off Catholic education and in the process, he's also killing off anyone feeling that they ought to attend church on Sunday. How utterly short-sighted! FWIW...whatever its other retrograde teachings, the Catholic Church isn't 'anti-evolution' and hasn't been for decades. It accepts that humans evolved from other species over billions of years, as science reveals, but asserts that only humans were endowed with a soul, an unprovable proposition in any case. Underlying all of course is the belief (common to pretty much every religion) that the universe was created by a god or gods, and that it has unfolded according to a mystical 'plan'. But that's nowhere near the creationism taught by some Protestant sects, such as those that deny an old age for the earth, and deny that evolution happens at all. 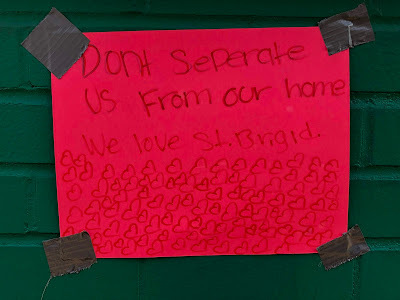 IOW, 'anti-creationism' is not a reason to not send your kids to St. Brigid's.